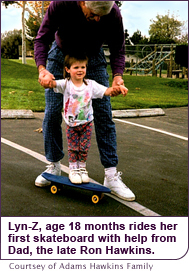 When she was only two, Lyn-Z Adams Hawkins received her first skateboard as a Christmas present from her dad, Ron. Living in the seaside town of Encinitas just north of San Diego, the little girl was more interested in her surfboard, riding her first wave at the age of five and competing by the time she was nine. In 1998 she found herself living in Sayulita, Mexico for half the year while her mother helped her grandmother manage a family bed and breakfast inn. Lyn-Z fit right in to her new location and surfing became her life. A natural athlete, she played a variety sports as she grew up, including soccer, basketball, baseball, swimming, diving and tennis, often playing on the boys teams because there were no girls teams available. When she was ten, her older brother Tyler, an accomplished street skater, got her into skateboarding. She loved the rush the sport gave her and quickly became a pint-sized star of the vert ramp. In 2000, at the age of 11, she competed in her first All Girl Skate Jam and by 13 she had a reputation as one of the top female amateur skateboarders in the world. Over the next few years, Adams Hawkins continued to rip it up in competition. 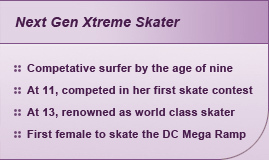 She won first place in the amateur level at the 2001 and 2002 All Girl Skate Jam in New York. 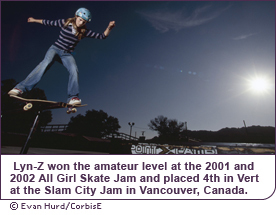 At the 2002 Slam City Jam in Vancouver, Canada the young skating phenom came in fifth in the Street Competition and fourth in Vert among the girls. Her unique ability didnt go unnoticed and she soon had sponsorship from Roxy clothing, Galaz shoes, Velvet eyewear, 187 pads, Pro Tec helmets, and Withitgirl. Lyn-Z continued to bring home the medals and was accepted as a younger sister of sorts by some of the male legends of xtreme skating. Shes practiced alongside the likes of Tony Hawk and Bucky Lasek at the top skate park in the United States, the Encinitas Y, which is conveniently located near her home in Cardiff-by-the-Sea. In 2003, 14-year-old Adams Hawkins competed in ESPN's Summer X Games IX in Los Angeles. It was the first year women were able to compete in the games and she won a silver medal in the Womens Street contest and brought home the bronze in Womens Vert. That same year, her beloved father Ron passed away, a blow to Adams Hawkins. But she remains tight with her brother and three older half siblings Lee, Wes and Ann. Her mother Lynn is her constant travel companion and helps manage her time at competitions. At the 2004 Summer X Games X, Lyn-Z became the first woman to ever attempt a Kick Flip Indy Grab in the competitions history, and landed it to take the gold in the Womens Vert event. The amazing run also showcased a Rocket to Fakie 360 and a Backside Nollie. She finished fourth in Women's Street that year. In 2005, she took a bad fall off of a ledge and hit the pavement so hard she needed 12 staples in her head and broke her arm in two places. The fierce competitor didnt let her injuries keep her from competing in the Summer X Games XI. With her arm still in a cast, she took home second place in Womens Vert and seventh place in the Womens Street contest. Adams Hawkins was also the first female to successfully attempt the goliath DC Mega Ramp, which is a daunting nine stories tall and as long as a football field. With her trademark fearlessness and agility she sailed over its 55 foot gap and skated down the 28 foot quarter pipe of its small side. Showing her gift for gab, in February 2006, Lyn-Z guest anchored Channel One's daily report, an online news and discussion forum for young people around the world. Unfortunately, February 2006 also brought another injury, when Adams Hawkins blew out her knee snowboarding. Since she couldnt compete, she kept busy announcing other snowboarding competitions and recording her character for Tony Hawks new video game, ‘Tony Hawks Project 8. She will be featured alongside such legendary pros as Paul Rodriguez, Mike V, Bob Burnquist, Rodney Mullen, Stevie Williams, Daewon Song, Ryan Sheckler, Dustin Dollin and Nyjah Huston. An MRI revealed that Adams Hawkins' knee injury required surgery. The operation was a success and after working hard to rehab her knee, she was quickly on the road to recovery. She is also an excellent student, attending the Seaside Academy, a public independent study high school that allows her to turn in her homework via email so she can travel to competitions all over the world. She is so hardworking that she will be graduating a semester early. With determination and dedication, Adams Hawkins made it to the top of an extremely challenging sport, even before she got her drivers license. In the future, she will, no doubt, continue thrilling her fans on the vert ramp with her daredevil style and unbridled athletic ability. When she isnt on a skateboard, snowboard or surfboard, Lyn-Z is a regular teen who loves to hang out with her friends, cuddle with her pillow, watch movies, and sleep in. Her favorite place is her room, where she spends hours on her computer. Her favorite foods include organic fruit, yams, salad, popcorn, candy and ice cream. Adams Hawkins truly is the face of skatings future. At only 15 years of age, she won the Womens Vert at the ESPN Summer X games XI, taking the gold from defending champion, Cara-Beth Burnside. Burnside, an icon of womens Xtreme skating, has been skating since before Adams Hawkins was even born.